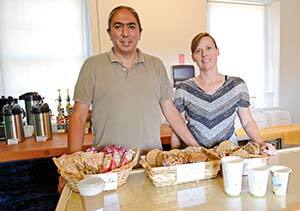 TOP: Mark and Rachel Charles are managing Coffee at the Hummingbird at Good Sheppard Mission in Fort Defiance. The coffee shop also offers free WiFi. BOTTOM: Mark Charles assists customers with their orders at Coffee at the Hummingbird at the Good Sheppard Mission in Fort Defiance. The coffee shop also offers free WiFi. 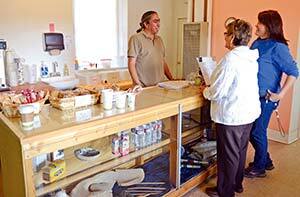 I n big cities coffee shops line the streets, but for the Navajo Nation a coffee shop is hard to come by. So to provide the community with gourmet coffee Mark and Rachel Charles are brewing up some dark roast in their new shop “Coffee at the Hummingbird.” The shop is collaboration between Good Shepherd Mission and 5 Small Loaves, an organization dedicated to public speaking, consultation and training opportunities in topics of racial reconciliation and historical injustices.